The late A.L. Basham was one of the world’s foremost authorities on ancient Indian culture and religion. Modelled on his monumental work The Wonder That Was India, this account of the origins and development of classical Hinduism represents a lifetime of reflection on the subject, and offersan intriguing introduction to one of richest of all Asian traditions. 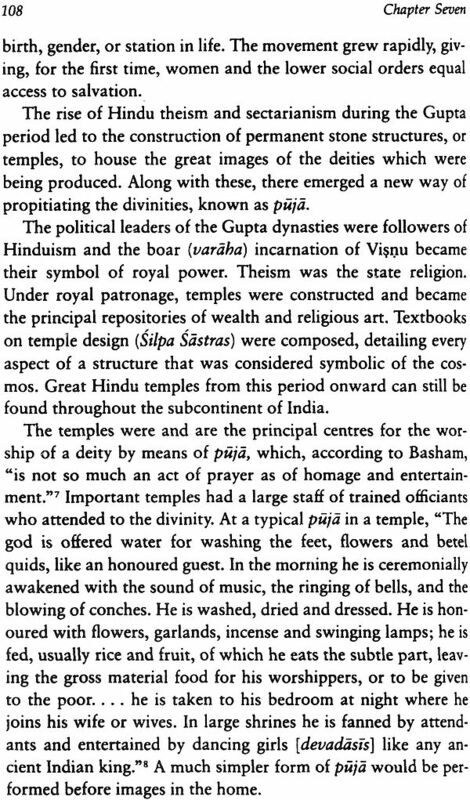 Synthesizing Basham’s great knowledge of the art, architecture, literature, and religion of South Asia, this concise history traces the spiritual life Indian from the time of the Indus Culture through the crystallization of classical Hinduism in the first centuries of the common era. and includes a final chapter by the editor, Kenneth G. Zysk, on Hinduism after the classical period. Uniquely comprehensive, it chronicles as well the rise of other mystical and ascetic traditions, such as Buddhism and Jainism, and follows Hinduism’s later incarnations in the West. With its vivid presentation of Hinduism’s sources and its clearly written explanations and analyses of the major Hindu texts-among them the Rg-veda the Brahmanas Upanisada, and the Mahabharata and Ramayana-The Origins of Classical Hinduism clarifies much of Hinduism’s enduring mystique. Offering an especially helpful bibliography, numerous illustrations of Hindu art never before published, and a lucid, accessible style, this book is must reading for anyone who has ever been intrigued by this fascinating religion. The late A. L. Basham was also the author of The History and Doctrines of the Ajivikas. Kenneth G. Zysk, a former student of Basham is Associate Professor at Department of Cross- Cultural and Religional Studies, University of Copenhangen, Denmark. His book include Asceticism and Healing in Ancient India and Religious Healing in the Veda. Hinduism is the major religious tradition of the subcontinent of South Asia. Its adherents in India number well over there hundred million. Like all the major religions of the world, Hinduism has spread beyond the borders of its homeland, originally to Southeast Asia and more recently to the Western world, where numerous neo-Hindu movements have found fertile ground. This book is a history of the development of Hinduism from earliest times to the early centuries of the common era, written by one of the world’s leading scholars of ancient Indian cultural history, A.L. Basham. One encounters a vocabulary dominated by the masculine gender during all stages in the development of classical Hinduism. This is not the case because of the author’s preference but rather because religious literature was composed entirely by priests and sages for the exclusive use of men of the higher socio-religious orders. Only after the classical period did Hinduism begin to give significant to women. 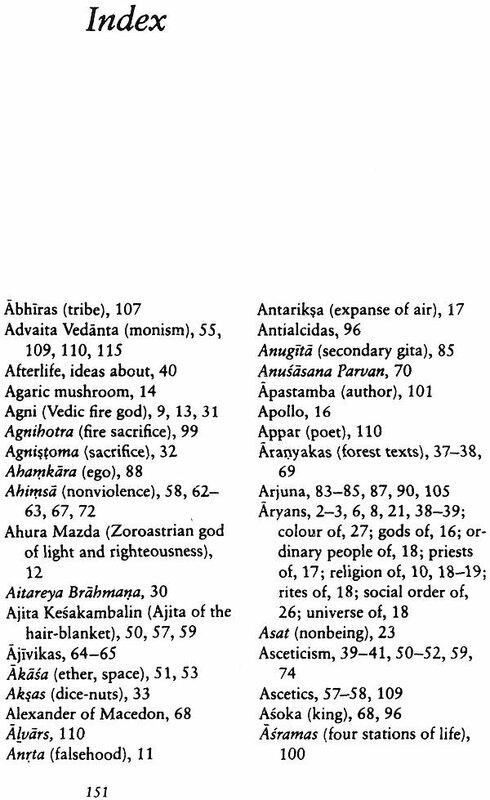 This corresponded, as we shall see in the last chapter, with the beginning of worship of female divinities whose names, of course in the feminine gender in the scriptures. The book is based on a series of five lectures given on ten key university campuses in the United States during the autumn, winter, and spring of 1984-85. They were the last public lectures in North America presented by A.L. 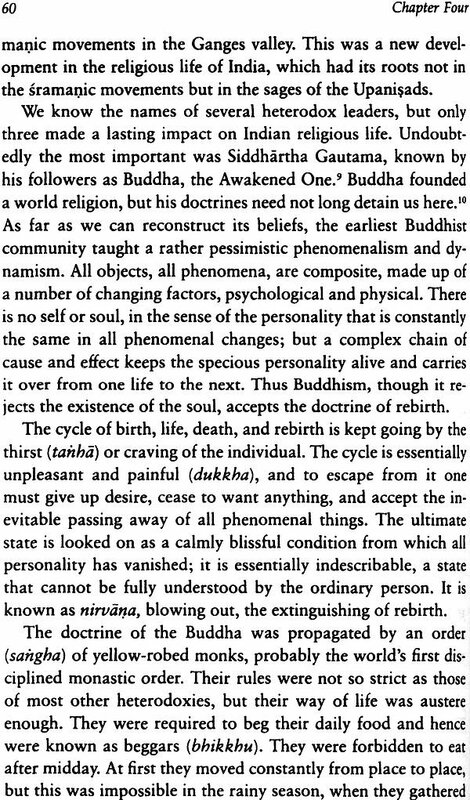 Basham before his death, in January 1986, and represent the synthesis of a lifetime of study and reflection on the origins and development of Hinduism. 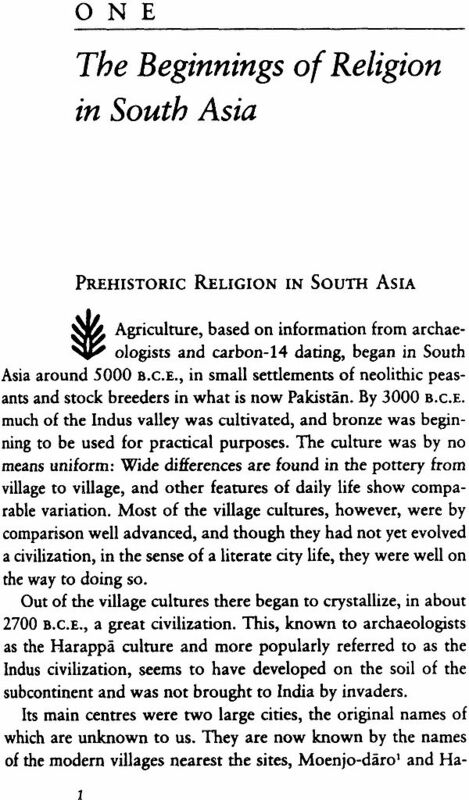 The first chapter begins with an examination of the prehistorical religion of South Asia, which dates from about 2700 to 1700 B.C.E. It is based principally on informed speculations from archaeological reports. 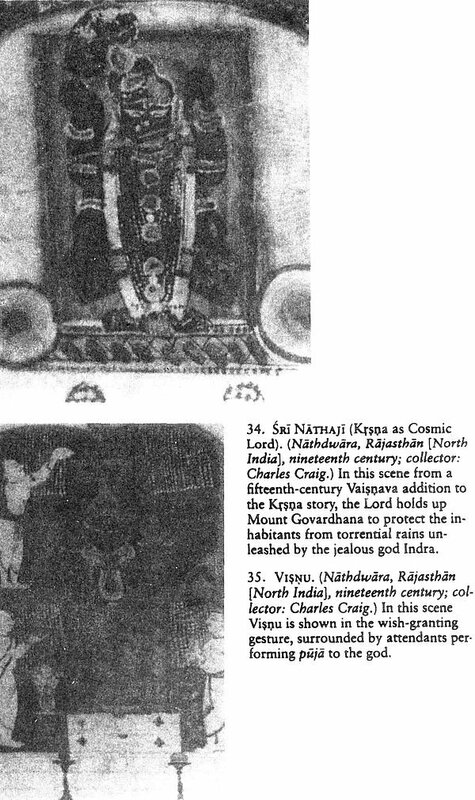 This is followed by a presentation of the religion of the early Vedic period (about 1500-900 B.C.E. 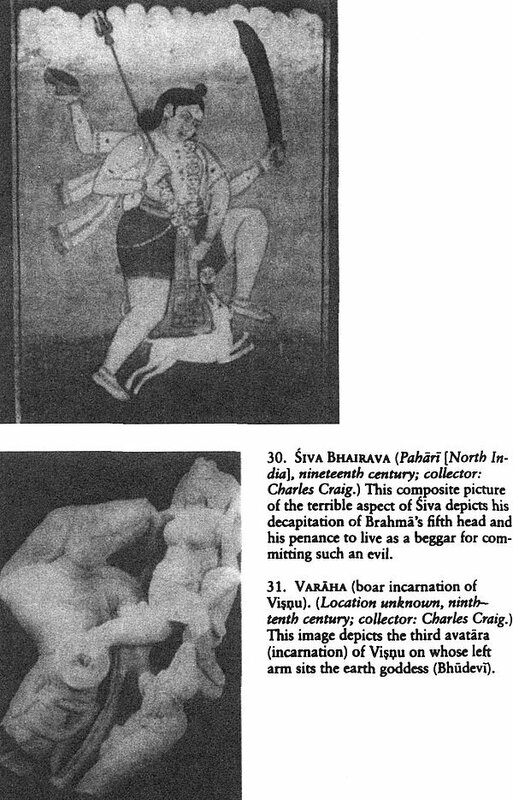 ), which offers a stimulating analysis of the sacrificial tradition of Hindu scriptures, as principal source material. 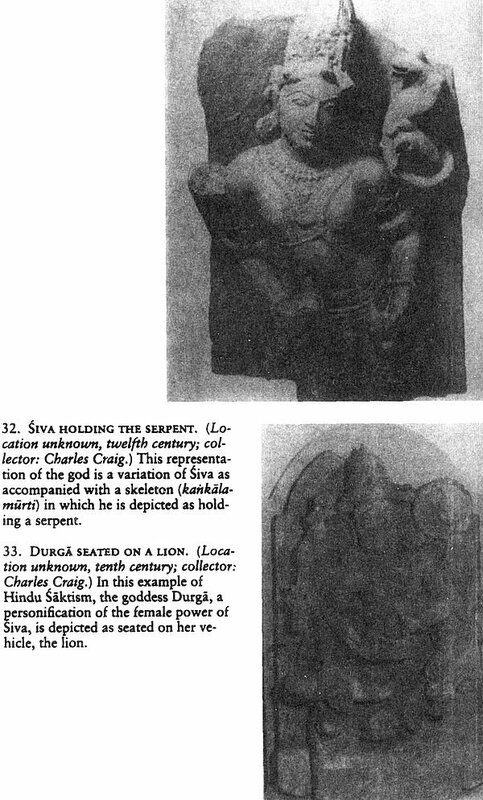 Chapter 2 uses the latest, or tenth, book of the Rg-veda and the Atharva-veda, a somewhat later Vedic text, to launch into a discussion of Hinduism’s attempts to explain the origin of the world. 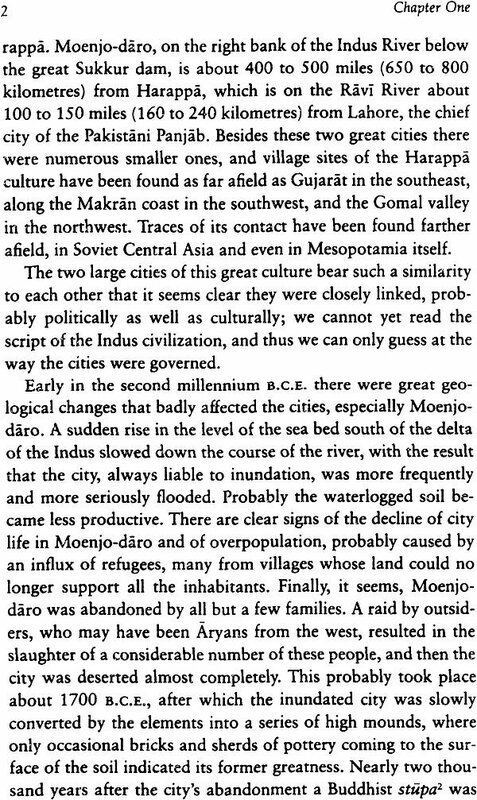 This is followed by a general analysis of later Vedic literature (about 900-500 B.C.E.) 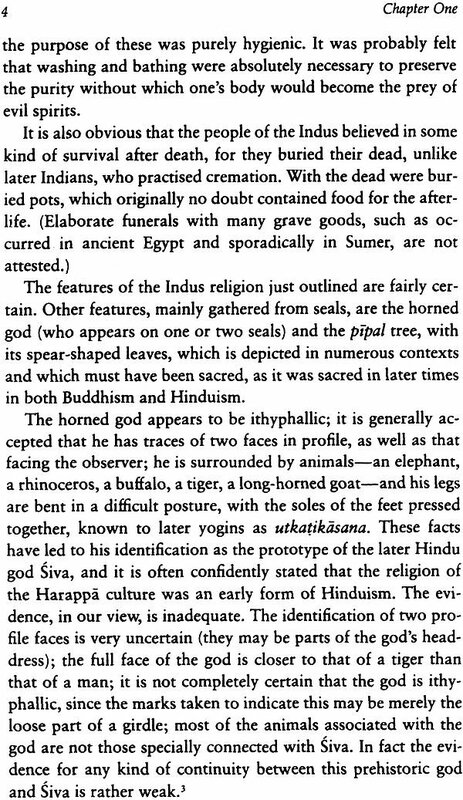 and its contents and concludes with a discussion of the Vedic sacrificial system. Chapter 3 focuses on the further development of Hindu philosophical thought in the speculative literature of the Aranyakas and Upanisads, which make up part of the later Vedic literature. This chapter contains the author’s unique analysis of the origin of the doctrine of transmigration. 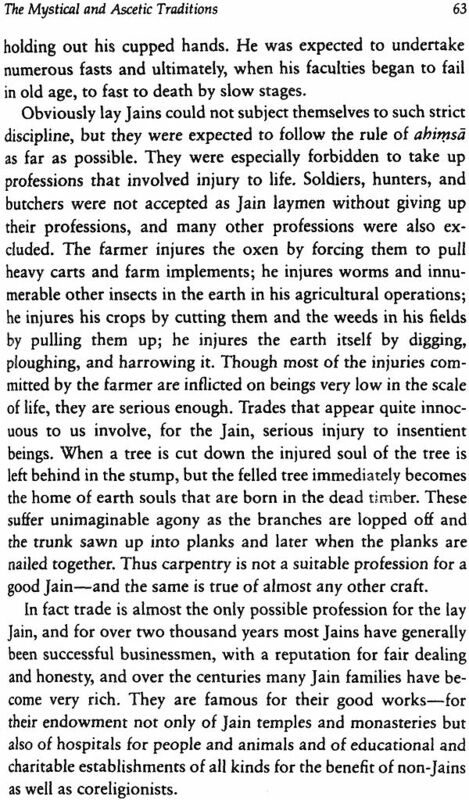 Basham radically departs from the existing theories, which suggest that the doctrine derived the existing theories, which suggest that the doctrine derived from the indigenous non-Hindu traditions of ancient India. 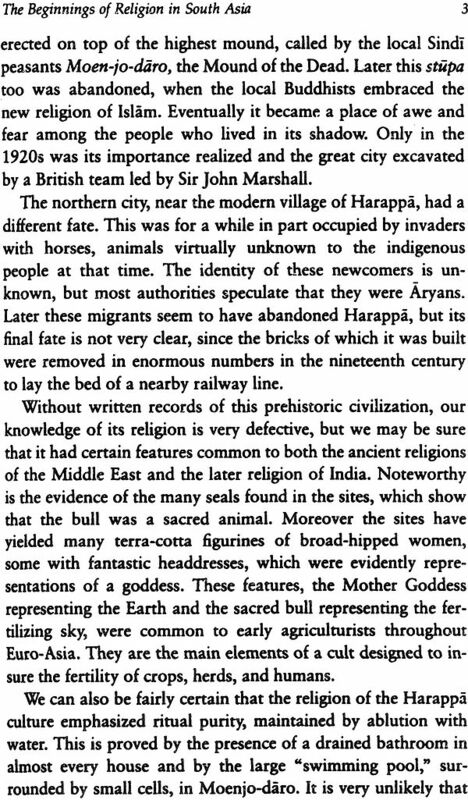 He offers strong evidence that the notion of transmigration was an esoteric doctrine, developed among certain circles of orthodox Hindus. 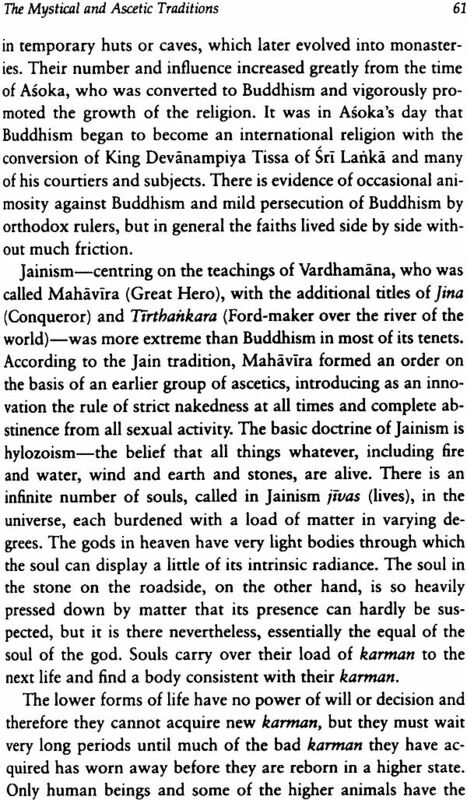 Chapter 4 examines the evolution of the mystic traditions beginning with the orthodox asceticism of the early Upanisads and continues with a brief survey of the principal heterodox ascetic traditions of Buddhists, Jains, and Ajivikas (from about the sixth to the fourth centuries B.C.E.). The author maintains that the heterodox forms of asceticism and mysticism derived from the orthodox forms. The final chapter contains the editor’s concluding remarks. 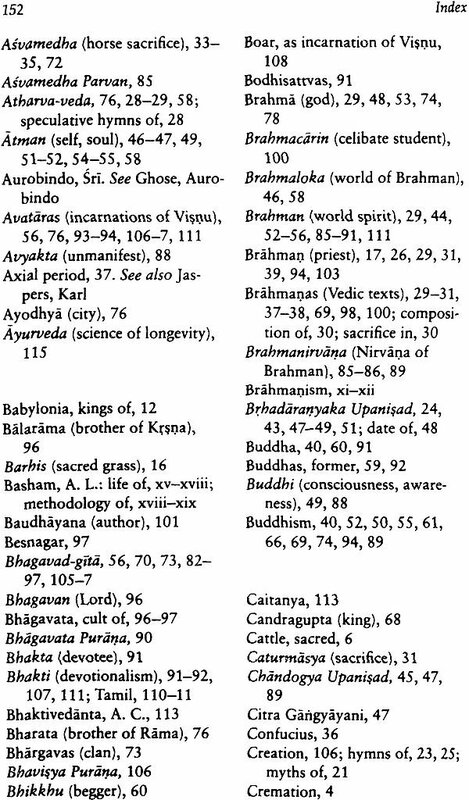 Previous chapters make only passing references to the manuals on Vedic lore (Kalpa Sutras) and the literature pertaining to the duties of a Hindu (dharma). The former date from about the sixth to the third centuries B.C.E., while the core writings of the latter range from the third century B.C.E. to the early centuries C.E. As these texts are crucial for the proper understanding of Hinduism, the editor has provided a brief survey of this material, along with a few remarks on the development of Hinduism to the present day, emphasizing the movements that have flourished in the West. 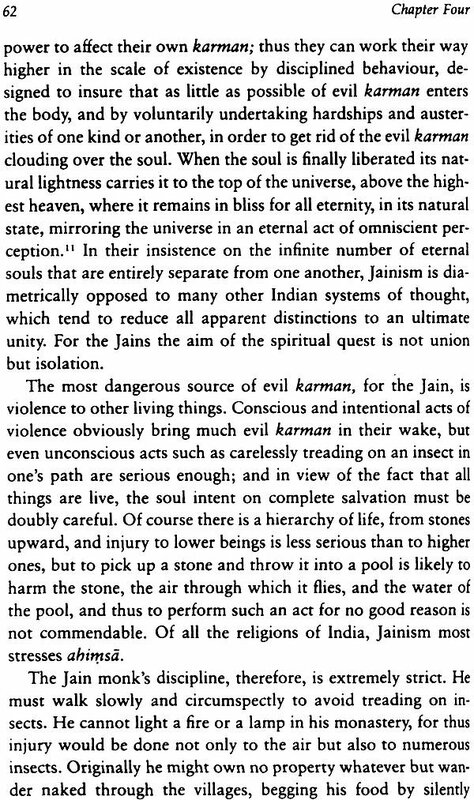 The intent in this chapter is not to be comprehensive but rather to sketch out the development of Hinduism after the Bhagavad- gita, and to illustrate its adaptability in the face of internal and external influences.